States and various other countries. applications held by Polycom, Inc.
© 2011 Polycom, Inc. All rights reserved. includes translating into another language or format. responsible for printing or clerical errors. Information in this document is subject to change without notice. that controls switch-over in the event of outages and balances resource usage. 80 have the same software. versions or releases that have been tested and verified in a lab environment. user account to access the documentation. figure shows an overview of the OpenScape Video V3 deployment solution. informed about busy or idle states. Simple presence information is supported. including iPhones or Android-based phones. applies to all SIP endpoints released with OpenScape Video V3. by VPN, for example, using MobileXpress. management, because device types are automatically detected and tracked. conferences. QoS and security profiles can be automatically assigned. ready to be seen on video. (RMX 1500/2000/4000) to mix the streams into one resulting video stream. The other conference partners can see both streams in one of their displays. application such as OpenScape Web collaboration through http or https. user can then adjust the presence state accordingly such as in a conference. OpenScape Video solutions strategically connect every video endpoint. with its SIP-based OpenScape UC solutions. SIP-based video endpoints of OpenScape Video V3. H.323/SIP Gateway is supported through the Polycom DMA system. using the DMA system as the gateway. interface, but does not support a dial-through functionality. interdomain video and gateway-based interdomain video. is shown in the following figure. product and a Polycom employee. hosted by a Siemens Enterprise Communications product. registered at different SIP registrars with an on-campus MCU. to meet on an MCU in the private domain, such as siemens-enterprise.com. [email protected], or just dial 77777.
network automation supported by Polycom endpoints. (Switches, Routers) from the database. system or VVX 1500 is connected. have moved or been reconfigured. using a network access control (NAC) solution. the measures to provide QoS by OpenScape Video. for all OpenScape Video endpoints from Polycom. a brief period of still video, then the conference continues. RMX system to another manufacturer’s MCU or vice versa. also based on available bandwidth to the location of this server. enabled, the application server would automatically create cascading links. the Polycom DMA system documentation at support.polycom.com. system must be configured to support H.323 signaling in order to enable cascading. monitor daily usage and plan the expansion as necessary. the network but sends its calls to a pool of SIP Proxies. it on another bridge. End users and administrators do not have to intervene. Some features of the Polycom DMA system are listed in the following table. OpenScape Voice to interoperate with Polycom products. when setting them up to interoperate in a Polycom environment. Open the Common Management Portal. Click on the Directory Number you want to modify or check. Password for HTTP Digest Authentication. Authentication User ID and Authentication Password fields. Click on the Name of the Endpoint you want to modify or check. documentation on this web site: support.polycom.com. Siemens OpenScape will be very similar. with Siemens OpenScape Voice version 5.
more information on setting up Polycom HDX systems. In the web interface, go to Admin Settings > LAN Properties. Making changes to any of the settings on this page will cause the system to restart. — IP Address: Specifies how the system obtains an IP address. address from the DHCP server on the LAN. the IP address currently assigned to the system. If you selected Enter IP Address Manually, enter the IP address here. address automatically. DHCP is not currently supported for IPv6. appropriately to provide the advertisement packets. Off — Select to disable IPv6. — Global Address: Displays the IPv6 internet address. Host Name: Indicates the system’s DNS name. DNS Servers: Displays the DNS servers currently assigned to the system. to four DNS servers here. choose must be supported by the switch. automatically. Choosing Auto automatically sets Duplex Mode to Auto. Mode to Half or Full. only; the settings for both must be the same. mode you choose must be supported by the switch. automatically. Choosing Auto automatically sets LAN Speed to Auto. must be the same. Polycom recommends that you set both to Auto. series, or Polycom HDX 9006 system. — Disable this setting for increased security. — VLAN ID: Specifies the identification of the Virtual LAN. The value can be any number from 1 to 4094. — Video Priority: Sets the link layer priority of video traffic on the LAN. — Audio Priority: Sets the priority of audio traffic on the LAN. — Control Priority: Sets the priority of control traffic on the LAN. The following IPv4 and IPv6 settings are available only on the web interface. number of milliseconds between transmitted packets. effect on “informational” ICMP packets, such as echo requests and replies. reasons other than network congestion. which is not specifically addressed to the HDX system. Indicates the protocol the system uses for SIP signaling. operating determines which protocol is required. TLS, TCP, UDP. This is the recommended setting for most environments. TCP provides reliable transport via TCP for SIP signaling. requires authentication, this field and the password cannot be blank. Specifies the IP address or DNS name of the SIP Registrar Server. Cascaded multipoint is not supported in SIP calls. the H.323 name or extension instead of the IP address. separately from the gateway ID on the Place a Call screen. your H.323 extension on the home screen. The H.323 Name is the same as the System Name, unless you change it. Your organization’s dial plan may define the names you can use. the extension that gatekeepers and gateways use to identify this system. Your organization’s dial plan may define the extensions you can use. Use Gatekeeper: Select this setting to use a gatekeeper. — Off — Calls do not use a gatekeeper. selected to enable H.235 Annex D Authentication. Gateways and gatekeepers are required for calls between IP and ISDN. IP Address field is not displayed. displays the gatekeeper’s IP address. Authentication: Enables support for H.235 Annex D Authentication. The following settings are available only when 802.1p/Q is enabled. ReadiManager SE200, or Polycom CMA system. Some gatekeeper settings are read only. Enable Use PathNavigator for Multipoint Calls. Create a group in the directory (recommended). was in the call originally. Country Code: Specifies the country code for the system’s location. Area Code: Specifies the area or city code for the system’s location. The default H.323 Extension can be changed. gatekeeper as an E.164 alias. system’s extension to call this system. services through the RMX Management pane of the RMX Web Client. IPv6 and IPv4 fields are displayed. This flag is related to enable BFCP. This setting enables network separation. This flag enables network separation using RTM Lan card for media. Unit if the RMX system becomes corrupted or inaccessible. a USB key or a cable to set the Management Network parameters. 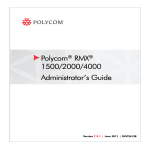 Administrator’s Guide and the RMX 1500/2000/4000 Getting Started Guide. such as endpoints, gatekeepers, SIP servers, and so forth. not yet been implemented, which indicates that the MCU must be reset. In the RMX Management pane, click IP Network Services. In the IP Network Services list pane, double-click Management Network. The Management Network Properties - IP dialog box opens. Select this option for IPv4 addressing only. Select this option for IPv6 addressing only. The IPv4 address of the RMX Control Unit. Client to connect to the RMX. The IPv6 address of the RMX Control Unit. Global site addresses are displayed. Manual site address is displayed. Enter the subnet mask of the Control Unit. Select to enable Secured Communication. for you to enable this feature. are not found on the local LAN. local subnet, no router is used. Enter the IP address of the router. is a specific component (Host) or a network. field, enter the IP address of the endpoint. Enter the subnet mask of the remote network. router segment in another network. endpoint found on another network. Off — if DNS servers are not used in the network. Specify — to enter the IP addresses of the DNS servers. Host and Shelf Management with the DNS server. Enter the name of the domain where the MCU is installed. The static IP addresses of the DNS servers. A maximum of three servers can be defined. are not part of the Management Network dialog box as for the RMX 2000.
speed and transmit/receive mode manually for LAN 2 Port only. The LAN port number: 1, 2, or 3. You can use the Fast Configuration Wizard to configure the Network Service. the Network Service has been deleted, followed by an RMX system restart. only if the factory default Management IP addresses were not modified. Service must be modified through the IP Network Properties dialog boxes. The Network Service - Networking IP dialog box opens. Fast Configuration Wizard. This name can be changed. sets that use Unicode encoding. Displays the network type selected during the First Entry configuration. The Default IP Network icon indicates the selected environment. — H.323 — For an H.323-only Network Service. — SIP — For a SIP-only Network Service. participants can connect to the MCU using this service. This field is displayed in all Network Service tabs. Enter the address to be used by IP endpoints when dialing in to the MCU. and content) through these addresses. Subnet Mask: Enter the subnet mask of the MCU. The default value is 255.255.255.0.
are the same as for the “Modifying the Management Network” on page 7-3. The Network Service - Gatekeeper dialog box opens. When Off is selected, all gatekeeper options are disabled. registered in the DNS or IP address. their dial-in string when dialing the MCU. also be defined in the gatekeeper. example, when using an alternate gatekeeper. re-registers. If set to 0, re-registration is disabled. alive’ operation – an alternate gatekeeper address may be returned. to five aliases can be defined for each RMX. The Network Service Ports dialog box opens. number of ports to be left open. When ICE Environment is enabled, 8 additional ports are allocated to each call. (1 signaling + 1 control). Displays the default settings for port numbers used for audio and video. the first and last port numbers in the range. When ICE environment is enabled, the range must be 2048 ports. The Network Service QoS dialog box opens. Network Service, not per endpoint. The routers must support QoS in order for IP packets to get higher priority. Enable: Select to enable the configuration and use of the QoS settings. (DSCP) bits in the IP packet headers are zero. DiffServ and Precedence are two methods for encoding packet priority. Select when the network router uses DiffServ for priority encoding. flags in the system.cfg file. router. Precedence needs to be combined with None in the TOS field. The default priority is 5 for audio and 4 for video packets. types of routers, as well as being currently the most common mechanism. routing the conferences’ audio and video packets. queue sequence and the delay between packets. None if you do not know which standard your router supports. The Network Service SIP Servers dialog box opens. Enter the IP address of the preferred SIP server. appropriate domain according to the host part in the dialed string. domain, to which it will forward the call. number must match the port number configured in the SIP server. The default port is 5060. By default, the Outbound Proxy Server is the same as the SIP Server. listening port number (if required). Enter the port number that the outbound proxy is listening to. as registered with the proxy. This field can contain up to 20 ASCII characters. password as defined in the proxy. physical Port numbers as labeled on the RMX 1500 MCU. 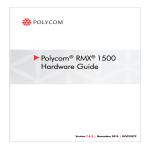 the RMX 1500 is shown in the following table. On the RMX menu, click Setup > Ethernet Settings. The Ethernet dialog box opens. manually set the speed and transmit/receive mode for these ports. proceeding downward to 10 Mbps Half Duplex. Outbound proxy and their interaction with the MCU. In the RMX Management pane, click Signaling Monitor. In the Signaling Monitor pane, double-click Default IP Service. host access is restricted to one default router. The subnet mask of the MCU. within the local site or organization. during registration. The lesser value of the two is chosen. Active — The active gatekeeper. Click the SIP Servers tab. Active — The default SIP Server is used for SIP traffic. The name of the SIP server. The SIP server's IP address. Not Available — No SIP server is available. Auto — Gets information from DHCP, if used. to connect to the RMX system using IPv6. IPv6 is supported with MPM+ and MPMx media cards only. The default IP address version is IPv4. connection to the RMX system. system is in IPv4 mode. be entered in the correct format. message, Bad IP address version, is displayed. IP Security (IPSec) Protocols are not supported. >> On the RMX menu, click Administration > System Information. Displays the System Software Version of the RMX. hardware has been detected in the system. to work with RPX and TPX Telepresence room systems. Displays the Serial Number of the RMX system. A Multiple Services license is installed. cards in the system are disabled. while it is powered on. The Card Configuration Mode switch occurs during the next restart. Card Configuration Mode that was active previous to powering down. WE and with Siemens OpenScape Voice versions 3.2 and 5. Type in the IP Address of your VVX (for example http://10.1.1.24). Click on the Line Key that you want to configure. when setting them up to interoperate in a Siemens OpenScape environment. Click on Continue to this website (not recommended). Select your Domain (default is LOCAL). Go to Log in > Admin > Local Cluster > Signaling Settings. — Add for a new SIP Peer. — Edit to modify an existing SIP Peer. workaround is available, it is noted in the table. connection, the call will not be established. disappears when the C party hooks on. system is setup with network separation. preferred device in the ODC web client. using Multimedia Internet KEYing (MIKEY). content might not be viewable. attendant or hear the announcement.